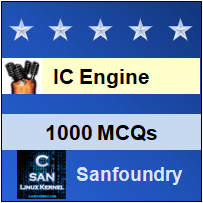 This set of IC Engines Multiple Choice Questions & Answers (MCQs) focuses on “Injection Systems – 1”. 1. In a fuel-injection system, the amount of fuel delivered into the air stream going to the engine is controlled by a pump which forces the fuel under pressure. 3. In an air injection system, __________ is forced into the cylinder by means of compressed air. Explanation: In an air injection system, generally fuel is forced into the cylinder by means of compressed air. Explanation: Fuel injector is used for CI engines and not for SI engine and gas engines. Explanation: Generally paper is not used as fuel filters. 11. A six cylinder, four-stroke diesel engine develops 125 kW at 3000 rpm. Its brake specific fuel consumption is 200gm/kW h. Calculate the quantity of fuel to be injected per cycle per cylinder. Specific gravity of the fuel may be taken as 0.85.